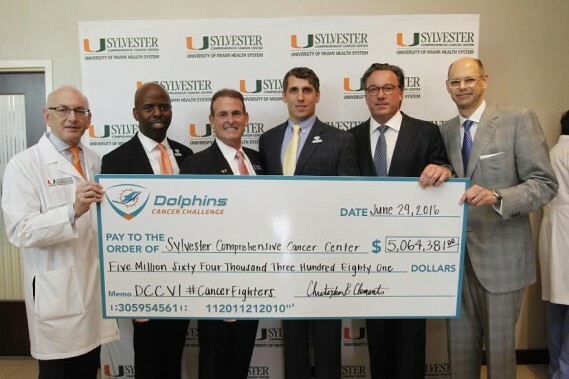 The Dolphins Cancer Challenge (DCC) will hold the fourth annual DCC Celebrity Golf Tournament at JW Marriott Miami Turnberry Resort & Spa’s two 18-hole championship courses with partners BBVA Compass and the presenting partners of the tournament, Moss Construction and JW Marriott Miami Turnberry Resort & Spa. The tournament will offer cancer fighters a chance to golf and interact with athletes and other celebrity guests. Funds raised from the golf tournament will benefit Sylvester Comprehensive Cancer Center, part of the University of Miami Health System. Golfers will tee off for a round of scramble-golf on the world-famous Soffer and Miller Courses, home to a number of LPGA and PGA events. For additional information, please visit DolphinsCancerChallenge.com. These efforts align with the Miami Dolphins mission of “Teamwork at Work.” Through Teamwork at Work, the Miami Dolphins Foundation is committed to leveling the playing field through the power of teamwork to inspire a healthier, more educated and united South Florida Community.